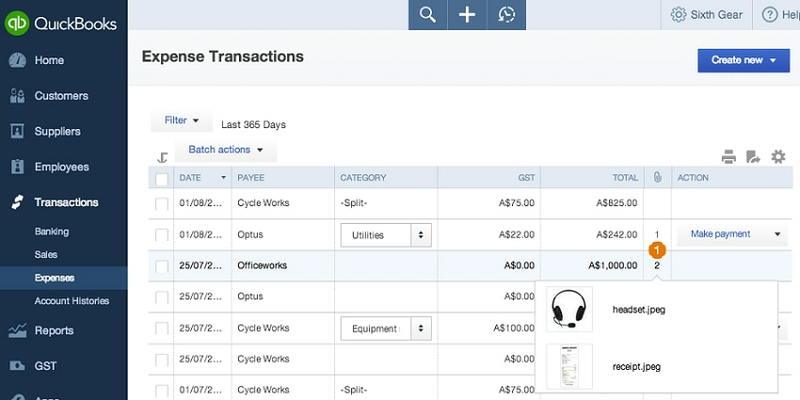 2014-08-24 00:00:002014-08-24 00:00:00https://quickbooks.intuit.com/au/resources/product-updates/gst-on-deposits-bank-feed-updates-more-all-based-on-your-feedback/Product UpdatesEnglishhttps://quickbooks.intuit.com/au/resources/au_qrc/uploads/2017/01/update.jpghttps://quickbooks.intuit.com/au/resources/product-updates/gst-on-deposits-bank-feed-updates-more-all-based-on-your-feedback/GST on deposits, bank feed updates & more, all based on your feedback! Here’s the latest round of QuickBooks improvements based on your feedback! (1) Show Attachments column on Expenses list. This shows the number of attachments per expense. Click a number to view thumbnails, and then click a thumbnail to open or download the attachment. Transactions > Expenses > Table Gear > Attachments. This can be helpful to make sure all your expenses have attached receipts! (2) Copy bank description to memo. Automatically copy the bank’s transaction description to the Memo field, making it visible on more reports, like General Ledger. Transactions > Banking > Table Gear > Copy Description. You don’t have to copy it yourself each time. (3) Change payee name on batch bank transactions. Change the payee name on multiple bank transactions at once. Transactions > Banking > Batch actions > Modify Selected. (4) Select a GST code for deposits in bank feeds. Apply GST to deposits. For new deposits (not reconciling deposits) you can now specify an associated GST code. This will show in the GST Centre and be correctly accounted for in associated reports such as the GST Liability & Detail reports. The Date filter now includes a choice for All dates. Transactions > Sales > Filter > Date and Transactions > Expenses > Filter > Date. New keyboard shortcut. Press the Esc key to close transaction forms (invoice, expense, etc.). Sub-customers are visible on billable cards and the Receive Payment form. You can now batch print more than 50 invoices at a time. Voided invoices are now properly labeled on the customer detail page and sales transactions page. Editing a customer’s address now reflects on transactions and recurring transactions. Various visual tweaks and cleanup. Coming soon will be a new and improved Customers page, a new and improved search, batch send/print of sales forms, and multiple templates! Got an idea or suggestion? Leave feedback by clicking the Gear icon in QuickBooks, and then click Feedback. This is the official way to get your ideas recorded and worked on!